The bus stop “Villacher Straße” is used by the KVG bus lines 32 and 34. The bus stop is located directly beside the driveway to our box. Use our drive way just right to the Lidl parking. Please note the driving direction and step speed. Therefore turn right on the parking area, towards the Speedmonsters motorbike shop. 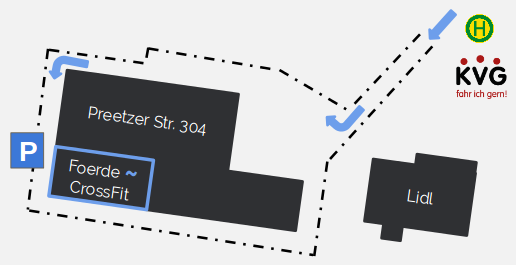 Follow the way behind the building, where our box and our parking area is located.